For the first time since 1986, the United States Men’s National Team will miss a FIFA World Cup. A loss against Trinidad and Tobago, and wins by Panama and Honduras, doomed the United States Tuesday night. Fans, former players and current United States players not on the roster reacted on social media. 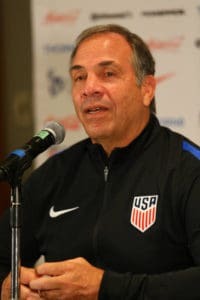 Plenty immediately – and rightfully so – began calling for the heads of Bruce Arena, the head coach, and Sunil Gulati, U.S. Soccer president. However, there has to be some blame on the players, right? The United States looked lazy, unmotivated and certainly didn’t look like a World Cup team. It’s hard to imagine if the United States would’ve made the playoff against Australia. With that roster and the players on the pitch, there’s no way they could beat the Aussies. However, they’ll be facing Honduras in the playoff, while the United States sits at home. Sitting at home, trying to figure out where to go from here. After the match, and over on ESPN News, Taylor Twellman, former U.S. National Team player, unleashed on the program. He hit every point and did so with all the anger that U.S. National Team fans were feeling. Twellman then elaborated that if the United States couldn’t beat Trinidad and Tobago, who were last in the Hexagonal group, that they shouldn’t deserve to go to Russia. Out of the 25 players on the United States roster against Trinidad and Tobago, 14 players were in Brazil. 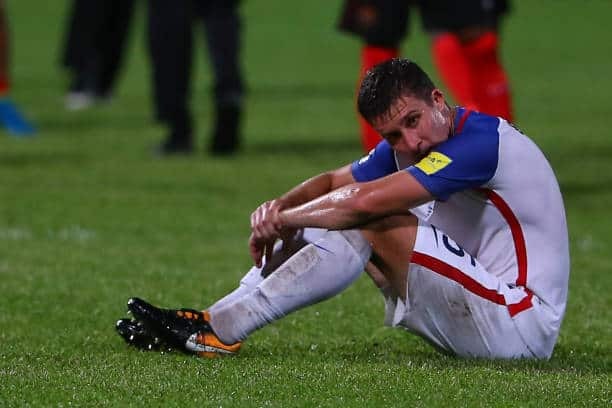 In the starting lineup, however, only six players were in Brazil (Michael Bradley, Tim Howard, Omar Gonzalez, Matt Besler, DeAndre Yedlin and Jozy Altidore). Despite head coach Bruce Arena’s sentiments that “nothing needs to change” within U.S. Soccer, something does. Yet, Arena ignored those players. He ignored a healthy Fabian Johnson, Timothy Chandler, and Danny Williams. Yes, John Brooks is injured, but Arena ignored English Premier League defender Geoff Cameron, leaving him out of the starting XI for the third-straight match. Those five players make fans wonder: if included, would the result be different? However, Arena did precisely what he shouldn’t have done last night: use the same starting lineup that he used against Panama. “… We’re all insane because the definition of insanity is doing the exact same thing knowing the result,” said Twellman. He couldn’t be more right. To stop that insanity, change needs to happen within U.S. Soccer. Tab Ramos is doing a fine job with the youth program, hence the success of young teams in their respective World Cups and tournaments. However, Arena and Gulati need out of the fold. Arena was to only be around just barely after the 2018 World Cup, but now it looks like his “sentence” might get cut short, just like his predecessor Jurgen Klinsmann. Also, Peter Vermes and Jesse Marsch have had their names tossed around for the position, and Ramos has even had his name added to the list. 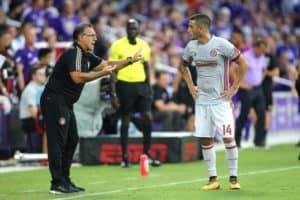 A former manager of the Argentine National Team, Atlanta United’s Tata Martino is a foreign coach who has appeared on radars. The United States needs to establish a technical director as well. Since Jurgen Klinsmann’s departure, there hasn’t been a clear senior technical director for the federation. Klinsmann was the man responsible for bringing the United States Johnson, Brooks, Williams, Christian Pulisic, Aron Johannsson, Julian Green, Chandler and Bobby Wood. Now is the time for the United States to build from the ground up. Cleaning the house is the only option for this team. Focusing on the youth programs, which – as Twellman mentioned – has had a lot of money funneled over to them. It’s time for some change in U.S. Soccer. This was the very tough wake up call. Or else, they could kiss Qatar goodbye, too.